Description: The Spyderco C157 LionSpy is a collaboration with Lion Steel knives from Maniago, Italy based on their Titanium SR-1 Monoblock Titanium Framed Knife. The LionSpy uses a combination of G-10 and Titanium with the same Reeve Integral Lock that the SR-1 uses. Also used in the design is a Patented RotoBlock system designed by Gianni Pauletta. It acts as a lockbar stop to prevent overtravel and when the knife is open can be rotated to lock the lockbar in place so that it does not accidently disengage. 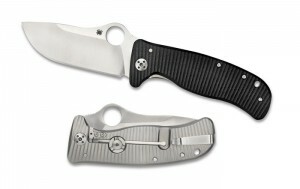 Overall, one of the most impressive knives from Spyderco to date, and the MSRP definately supports that as well! This entry was posted on Thursday, March 1st, 2012 at 12:01 pm	and is filed under 3" to 4" Knives, Designer - Lion Steel, Features - Screw Construction, Handles - G10, Handles - Titanium, Lock - Frame Lock, Lock - Reeve Integral Lock R.I.L., Manufactured - Italy, Steel - ELMAX, Type - Folding Knife. You can follow any responses to this entry through the RSS 2.0 feed. You can leave a response, or trackback from your own site.